Easter School Holidays - sorted! Easter is late this year - Sunday 21st April - but the school holidays will be here before we know it. Which means a couple of weeks when the kids are at home and we need to think of things to do. Whether you are a working parent who has a bit of time off over Easter, or full-time carer who will be with the children for the whole school holidays it can be hard to find things to do together. Things that you will all enjoy and really will be that much-revered “quality time” rather than a complete disaster! So we’ve put together ten ideas for things to do over the Easter School Holidays. One for nearly every day! here. But wherever you live, check out what is available within easy travelling distance and you are bound to find something to keep everyone happy for a day. If the weather is kind then get everyone out in the fresh air. You may want to organise games in the local park, a walk in the country, or a picnic on your nearest beach. But having a day outside, away from screens and doing some physical activity will do you all the world of good and bring you all together. A variant of this is to check out the growing craze of geocaching, where you use GPS devices to locate hidden containers called geocaches. It can be great fun for all the family. Find out more details at https://www.geocaching.com. A well-loved tradition for Easter Sunday is an Easter egg hunt, which you can organise inside or out depending on the weather. But if that’s not going to work for you this year for any reason, then why not organise a treasure hunt on another day? It doesn’t necessarily need to be home-based. In fact it could be fun to explore your local city with the help of clues to lead you from place to place. It will take a bit of advance organising but can be a fun way to spend time together getting to know your city better. Sigh! It’s the thing that all children want to do during the school holidays so is definitely worth considering. You don’t need to go to one of the big names: there are niche theme parks all across the UK. But if you do decide to go for one of the big ones then save money by looking out for special offers: check out offer sites such as Hot UK Dealsto see if you can get a good price. Many of us are fascinated by car boot sales, and enjoy watching related TV programmes. We all want to find that elusive bargain that will make our fortune! Even though that’s unlikely to happen, car boot sales can be great fun and there are often extra special ones over the Easter period. Children can be happily occupied for hours choosing what to buy - and can end up with lots of stuff for a very small amount of money. You may even decide to do a bit of decluttering and set up your own car boot stall?! Most children love interacting with animals, and there are plenty of opportunities available over the Easter holidays. As well as the wide variety of zoos - large and small - across the UK, there are also many petting farms and animal sanctuaries. Many offer admission for free or for a small donation, such as The Donkey Sanctuary Sidmouth in Devon, Buttercup Goat Sanctuary in Kent , or The Owl Sanctuary in Ebbw Vale. There are also many working farms in the UK that welcome visitors and offer the opportunity to help with the animals, such as Occombe Farm in Devon. Many of us never consider going to a church, but Easter is a good time to pay a visit. It can be a refreshing experience and a good family bonding time, and whether you prefer traditional or something more modern there is bound to be somewhere local that fits the bill. Many churches also run extra activities around Easter aimed at families and children so why not check out what is going on in your area? Staying on the local theme, also look out for local spring events in your area. There are likely to be a range of events happening: from music festivals, spring fairs, farmers markets, traditional Easter games and fun races. Or consider volunteering for a community activity such as countryside clearing or litter picking. Look around and you are likely to be pleasantly surprised at what is going on right on your doorstep. Some of the above ideas rely on the weather being good. Which hopefully it will be. But a good back up plan for a rainy day is to all enjoy a film together. There will be new releases at your local cinema - for example Tim Burton’s remastered Dumbo will be out at the end of March - or you can organise a family film day at home and watch everyone’s corny Easter favourites! Time is precious, and whilst as parents we may grumble about school holidays they can be special times and do not last forever. Before you know it, they will be a thing of the past. And funnily enough, you will miss them. 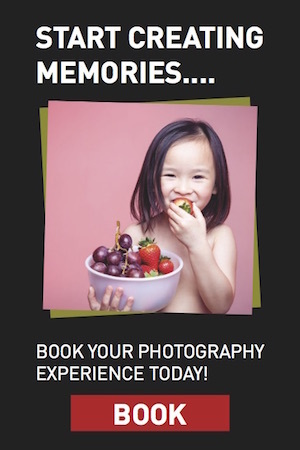 So why not take some time during these school holidays to enjoy a family photography experience at Venture Studios? As well as being fun for all the family now, you will be capturing precious memories of your family to enjoy in the future. We have various photography experiences available. You can either book online, call us on 0845 121 1085 or use our Studio Finder to find your nearest branch. We look forward to meeting you and your family and giving you not just a fun experience to enjoy now but some wonderful memories for you to treasure forever. Happy Easter from all of us at Venture Studios.